I've been doing quite a bit of commuting on the Amtrak Cascades corridor as of late, for both school and visiting friends. Here are some photos taken during a recent journey to Portland, OR. Amtrak's Empire Builder service derails on Everett-Seattle corridor as it is hit by a mudslide. Note that this corridor is also shared by the Amtrak Cascades service that operates multiple daily trains between Vancouver, BC and Portland, OR. 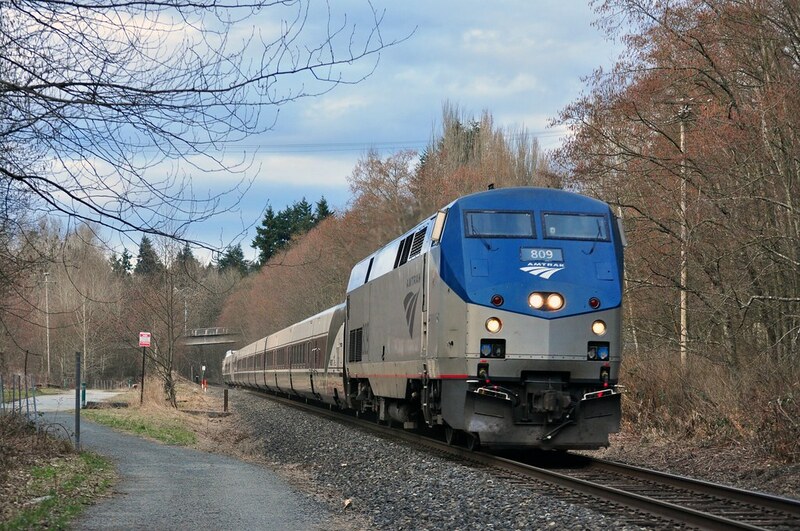 Sounder and Amtrak customers are riding buses again rather than rail lines north of Seattle because of a mudslide that derailed a passenger train Sunday. Sounder and Amtrak customers are riding buses again rather than rail lines north of Seattle because of a mudslide that derailed a passenger train Sunday — the latest in what has been an exceptionally bad season for mudslides in that area. Sounder service between Seattle and Everett is canceled Monday and Tuesday, when Sound Transit will provide special express buses to and from the Sounder stations. Amtrak expects to resume service Tuesday morning. There were 200 slides during the fall and winter, 50 of them blocking tracks, BNSF Railway said in February. The most spectacular hit a moving freight train in mid-December and derailed seven cars. A March 21 slide buried tracks in five feet of debris. Sound Transit has canceled a record number of Northline Sounder runs this rainy season. None of the train’s 86 passengers and 11 crew members was hurt in Sunday’s slide just north of Howarth Park in Everett, which had little impact on some railcars but badly jostled others. “We almost went over,” said Alicia Munds, of Silverdale, who had just awakened about 8:50 a.m. Sunday when the train suddenly jerked like something had hit it. As her car, the last one on a train bound for Seattle, tipped to its side and started to pull up the tracks, Munds covered her sleeping 7-year-old daughter, Hannah, with her body. 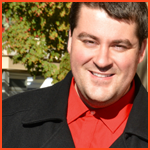 “It was like being thrown around like a rag doll," Munds said of the experience. “They hit the brakes immediately,” she recalled. “That engineer saved our lives. We would’ve been drug over,” she said. Other passengers saw mud and trees sliding down a cliff and striking the train. “We saw chunks of mud coming down and hitting the train, but it was not as scary as you’d think,” said Sherry Brooks, who boarded Amtrak’s Empire Builder train in Chicago on Friday for a visit to her son in Seattle. The train came to a halt with three cars derailed, two of them visibly tilted off the tracks. The train’s front cars transported passengers to Mukilteo, where they boarded buses for Edmonds and Seattle. The slide, which BNSF Railway spokesman Gus Melonas described as 15 feet high and 30 feet wide, prompted the company to issue a 48-hour moratorium on passenger trains on the railway’s double main line. About a quarter mile of track was damaged, but freight trains were able to get through on the adjacent line Sunday and will resume travel on the line where the train was derailed sometime Monday, Melonas said. 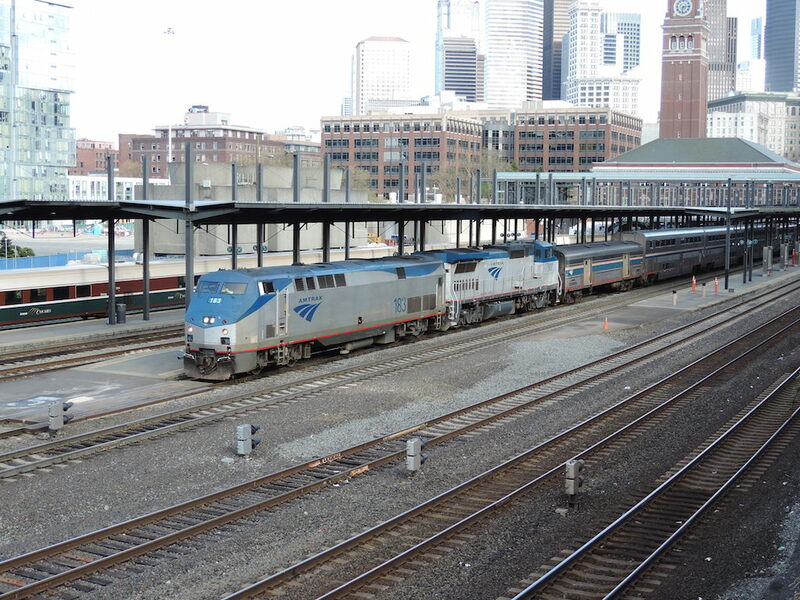 Until passenger service resumes, Amtrak will bus passengers between Seattle and Everett, according to Marc Magliari, an Amtrak spokesman in Chicago. 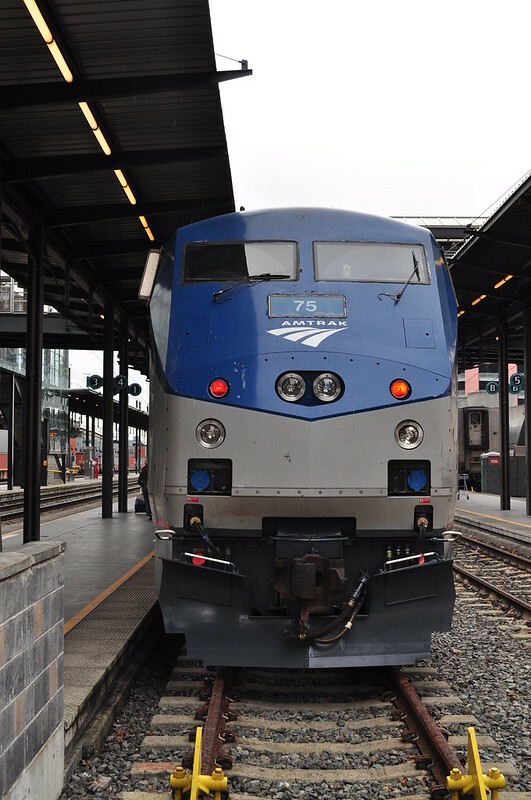 It also plans to bus Empire Builder passengers between Seattle and Spokane, because they cannot travel the line’s usual route through Everett. Construction is expected to begin later this year on a $16 million, federally funded project to stabilize six or seven spots along the Seattle-Everett corridor that have been prone to mudslides. BNSF will construct retaining walls, remove loose soil and install drainage pipes in soggy areas. 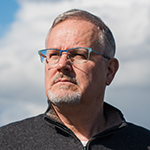 A BNSF presentation to Sound Transit showed standing water near suburban homes in Mukilteo, and pointed to years of residential development as a contributor to slides. Some transit-board members wondered if global warming is causing wetter seasons. The Washington Department of Transportation warns that much more work needs to be done to fully prevent mudslides. Seattle Times staff reporter Mike Lindblom contributed to this report. These Empire Builder riders were very lucky. I've been aboard this train many times and is one of the most beautiful rides in the Amtrak's system. The Seattle branch of this train consists of locomotives, a baggage car, a crew dorm, two public sleepers, a dining car, and two coaches. Seeing the photos in the Times, the dining car and the two coaches were left on the spot. The sleepers took the passengers to Mukilteo. Breakfast service in the Dining Car usually ends in the Cascade Tunnel as the crew has to prepare for the turnaround crew in Seattle. Pillows are usually taken before or after Everett in the seating areas. You can separate a Superliner trainset as well as Amfleet, Horizon, Heritage, Acela, and commuter trains. You can't really separate a Talgo trainset, though, unless it's in an Amtrak yard. Seattle branch (CHI-SPK-SEA), no continued service into Seattle from Everett on Sunday morning. No eastbound trip from Seattle that evening. No service today. Portland branch (CHI-SPK-PDX), Train 27 arrived PDX 0951PDT Sunday morning. Turned around. Departed as Train 28 from PDX at 1645PDT on time, arrived SPK at 2354PDT. It would have mated with the Seattle branch and continued east at 0130PDT. Instead, I think it waited for the westbound combo's arrival at 0140PDT. The Portland branch of that train arrived PDX early this morning. The Seattle branch would send its passengers to Seattle from SPK on buses and the set would be turned around, cleaned, and mate to the waiting eastbound Portland branch. 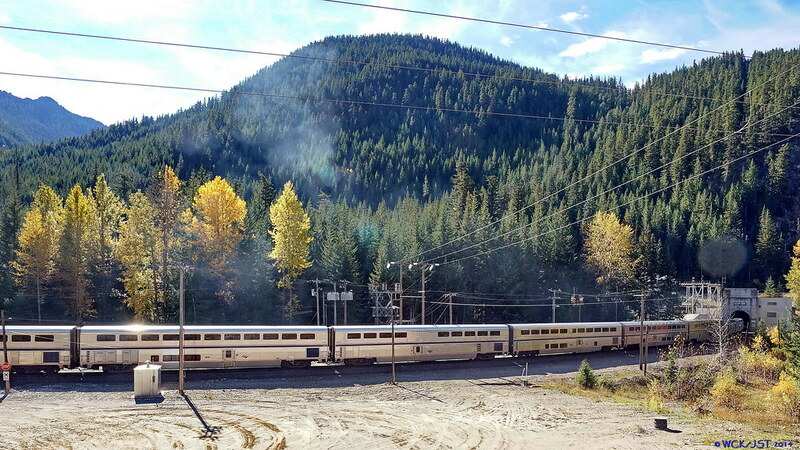 The set departed SPK late at 0506PDT, giving its passengers a rare daylight passage along the Kootenai River this morning (this passage usually takes place overnight). ETA Havre MT: 1701MDT today. Being a regular on Amtrak's Cascades service, I am driving down to Bellingham today to check out the Amtrak National Train Day display. 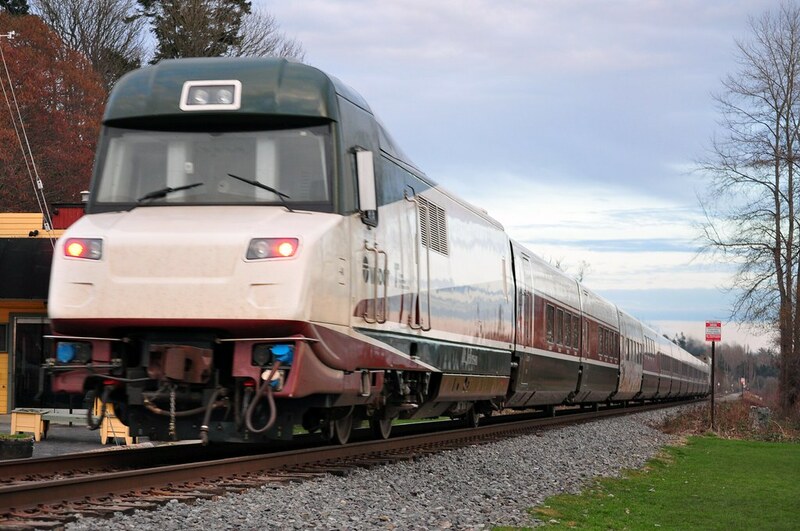 I had my hopes up that they would be showing off the new Talgo Cascades equipment, but I think that will be down in Portland, as the sets are owned by Oregon DOT. A thread for all things Amtrak. Meant to post this awhile go. Amtrak train #517 departing Mount Vernon, WA in September 2013. The snow was a nice addition to an already planned photo. 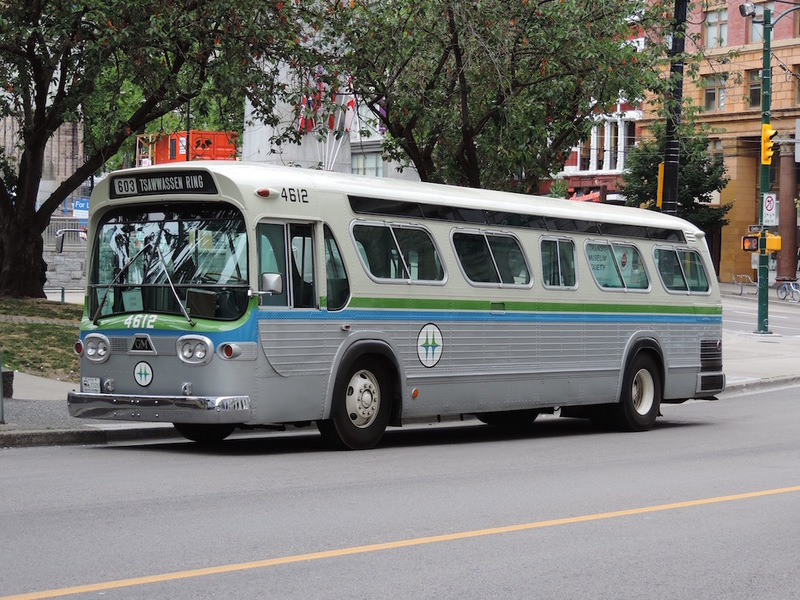 That's one nice photo of a mode of transportation I used four years ago in getting to and from the Vancouver 2010 Winter Olympic Games. 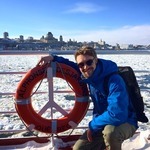 Today was closing day for Sochi's Winter Olympics. Like Vancouver, the Russians outdid themselves in making these games memorable. Congratulations, Canadians, on your Golden performances! Wished we had this kind of snow on my train rides to Vancouver's Olympics. Kind of an urge to go to, or do, a winter sport! 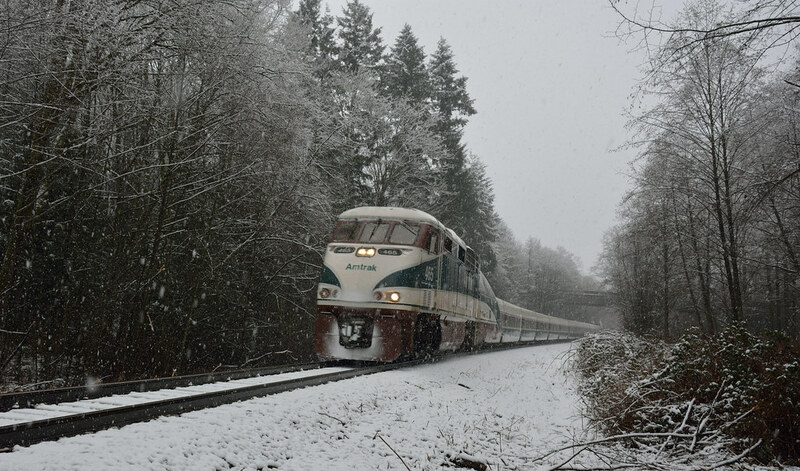 Amtrak Cascades Service operating South of the Fraser. 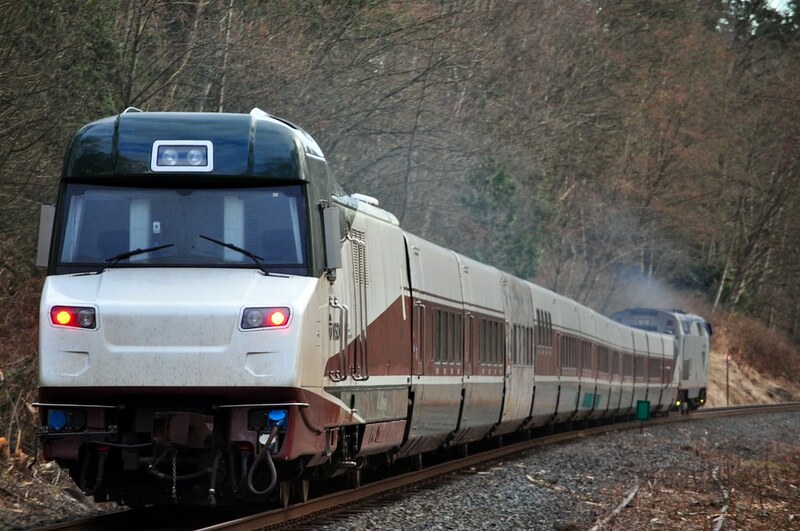 This is one of two new Talgo trainsets that came into service at the beginning of this year, owned by the Oregon Department of Transportation. These pictures were taken in Burns Bog and White Rock. This morning, Amtrak and the FRA awarded the contract for new diesel high-speed locomotives to Siemens USA. The locomotives will be of their 'Charger' series, similar to what already exists in Europe. They will be similar in appearance to the 'City Sprinters' currently being rolled out on the Northeast Corridor, except without the overhead gantry. 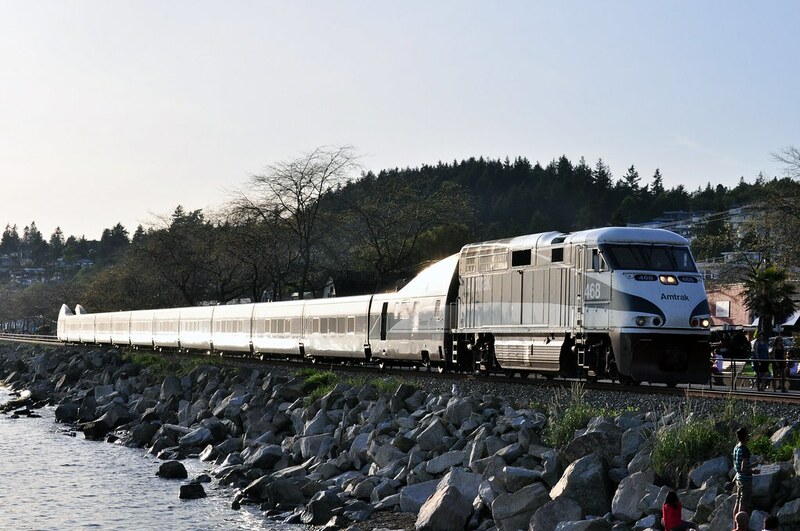 In addition to Washington's Amtrak Cascades service, these locomotives will be used in California, Chicago and the Midwest. Illinois Department of Transportation led the procurement for six other state DOTs. They will be built at Siemens USA facility in California. They look similar to some of trains I rode on in Italy. 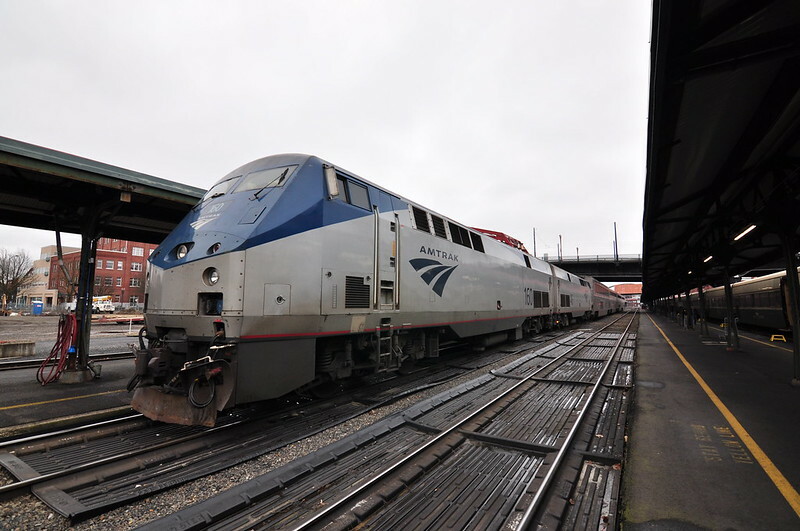 In an effort to be good stewards of the federal funding received to operate our Amtrak service, a number of steps are being taken to eliminate losses in our Food and Beverage department over the next five years. 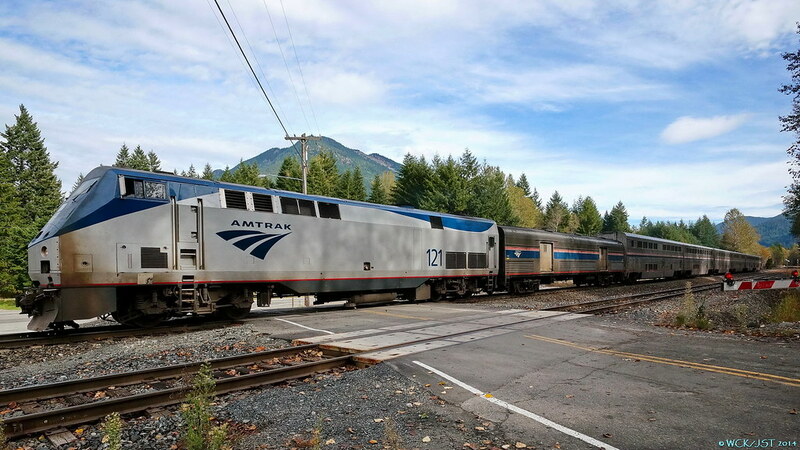 Some of the changes being made to accomplish this include the discontinuation of select amenities on the Coast Starlight, Empire Builder, and Lake Shore Limited. On or about March 31, 2014, the pre-departure refreshments and on-board wine and cheese tastings for Sleeping car passengers will no longer be offered on the Coast Starlight, Empire Builder, or Lake Shore Limited. Additionally, the complimentary sparkling wine, non-alcoholic cider, and chocolate squares will no longer be provided to Sleeping car passengers on the Empire Builder and the Coast Starlight. Sleeping car passengers will continue to receive all regular meals in the Dining car at no additional charge, and passengers may purchase cheese and cracker trays and other snacks, as well as liquor, wine and beer, in the Lounge car on all long- distance trains. 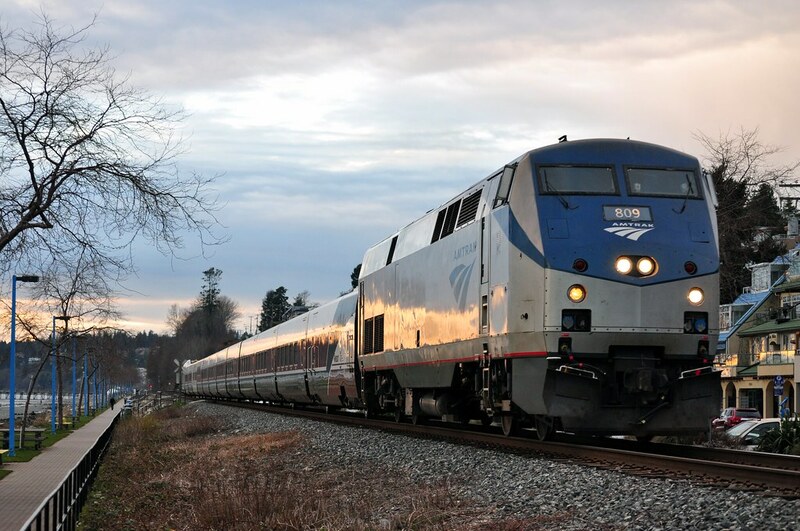 On approximately May 31, 2014, complimentary amenity kits will no longer be provided to sleeping car passengers on the Empire Builder and the Coast Starlight. Your Sleeping car attendant will continue to have select emergency toiletries on hand when needed. 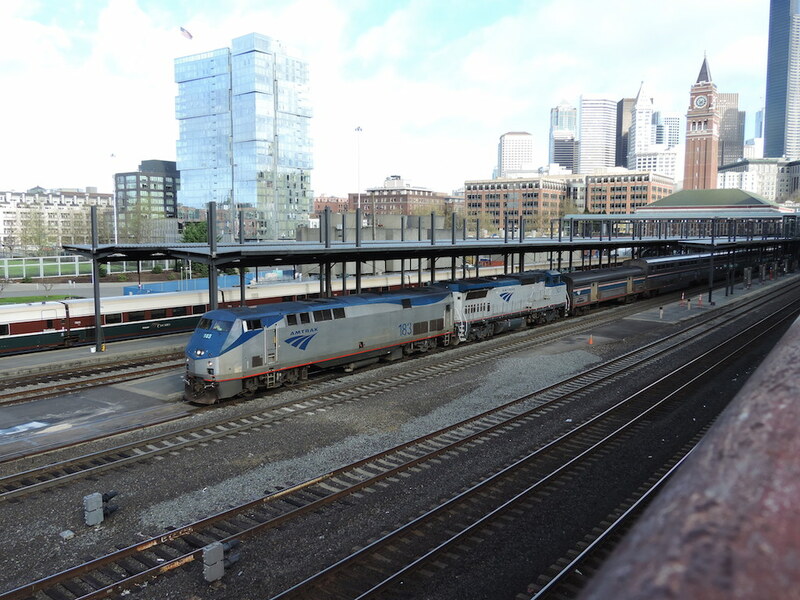 While it is never easy to tell you, our valued customers, that we are eliminating some amenities, these changes are necessary in order to reduce costs, increase revenues and preserve passenger rail service across our country. If you have any questions or comments about these changes, feel free to contact me using the “contact us” link on the Amtrak.com home page. Thank you for traveling with Amtrak. We appreciate your patronage. 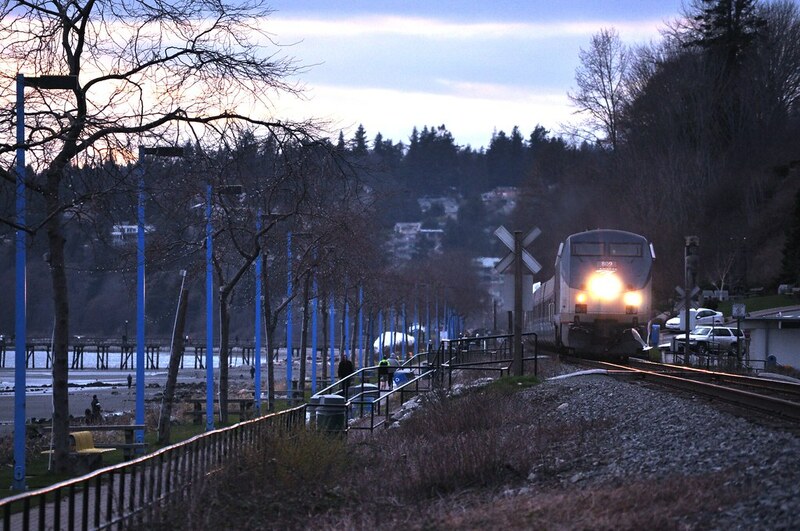 Amtrak operating it's Cascades service in White Rock. Here are a few photos of Amtrak's west bound Empire Builder en route to Seattle via J.J. Hill's one-time Great Northern Railway (now BNSF's Scenic Subdivision). The first two photos show the train approaching the east portal of the Cascade Tunnel under Stevens Pass. 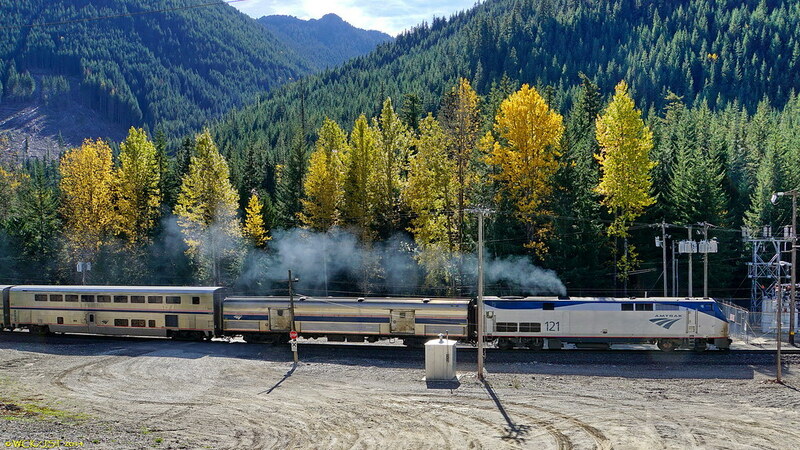 The third photo is from further west near Skykomish, Washington. These were seen & photographed by me on 10 October 2014. Has anyone taken the Empire Builder? From what I've heard, it's not as popular or as scenic as the more southern cross-continental routes, but it must go through some spectacular scenery through the Rockies and Cascades. The Builder is nice, however the scenery of the Southwest Chief and especially the California Zephyr make both of the central routes more appealing in my view. However the Columbia River branch of the Builder is fantastic as well. The two southern routes are also usually cheaper than the Builder, and the Chief especially is a lot more reliable. I am posting these photos because 507, GE Dash 8-32BWH, which are super rare see one. 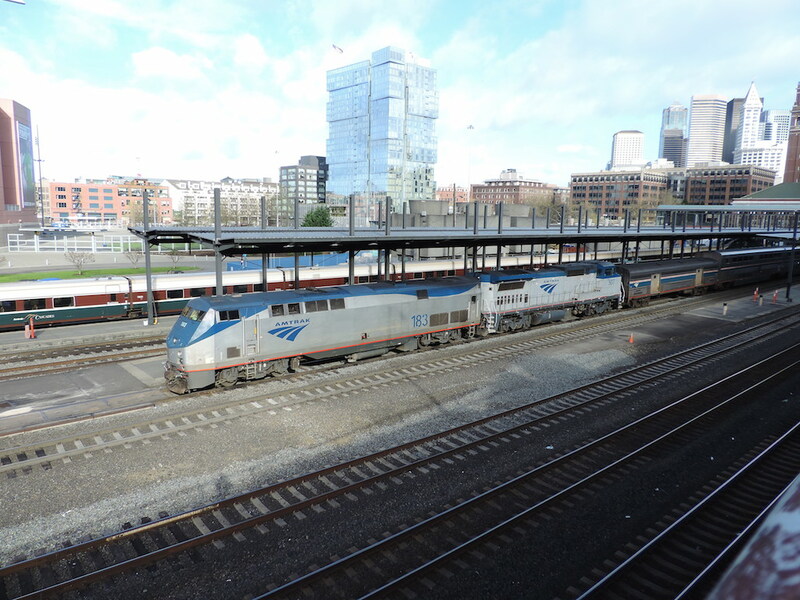 By the way, Seattle should be seeing something new in the Coast Starlight and Empire Builder (the Seattle branch) train consists in the months ahead. I'll keep you in suspense and let you see it for yourself whenever it appears. If anyone gives a correct clue on this thread, however, I'll tell you what it is. Internet forums are the ultimate breeding ground for speculation, but I recall seeing photos of one of the new roll-on bike carrier cars in Spokane. Is this what you have in mind? You two are getting very close. One hint I'll give you is that this new rolling stock equipment measures about 85 feet long. New Bilevel cars for the trains or brand new engines. I love that you take your bike on a Inter-city train. I find it kinda of funny. Based on recent photos I've seen through railfan circles, I'm going to guess it is the new baggage cars. Amtrak is getting a lot of new rolling stock for its eastern services as well as its long distance service across the country. All four types follow an identical body shape. Only the interiors are different as well as a few under car and exterior details. These follow most of the design of the original VIEWLINER I sleepers and lone dining car. Amtrak is retiring its fleet of heritage baggage and dining cars. They may be off the active roster by the end of this year(2015), if all goes well with the new equipment. Do an internet search for "viewliner" to see lots of photos and go to youtube.com to get videos.